Whether you want to lose weight or find a diet that chimes with your body type to bring you optimum health, Anjum's Ayurvedic Diet is for you. It's scarcely believable that Anjum Anand could ever have had a weight problem, but in her early 20s she was overweight and a serial dieter. She eventually lost all the weight but it took a while to discover the diet she should follow both to lose and to maintain weight loss. Finally, she found the solution, not from modern Western science or diet experts, but in the Indian system of Ayurveda - the oldest and most holistic medical system on the planet. Translating as 'the science of living wisely and well', Ayurveda teaches us how to maintain optimum health and harmony both within ourselves and with nature. It recognises three body types and, once you've established your basic body type, you can not only find the diet that will best suit you (and get your body back into shape) but also correct any imbalances to resolve eating and digestive disorders, sleep problems and many other illnesses. 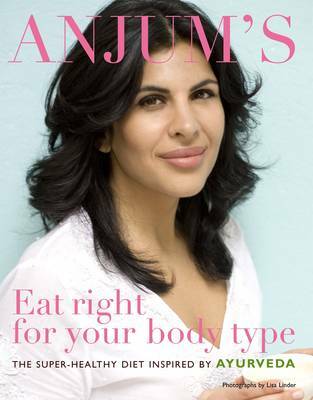 In this groundbreaking new diet book Anjum shows how to work out your body type, the foods you should eat (or avoid) and how to combine them into delicious recipes for every meal. Uniquely, this Ayurvedic cookbook includes recipes from East and West as well as complete food charts stating which foods are best for each dosha. For anyone purely interested in healthy eating the 75 recipes are all low fat and healthy, but each is labelled according to its suitability for each body type. Good eating hints and tips, a range of meal plans and advice on recommended exercise and lifestyle for each body type complete the book.